Hello everyone! 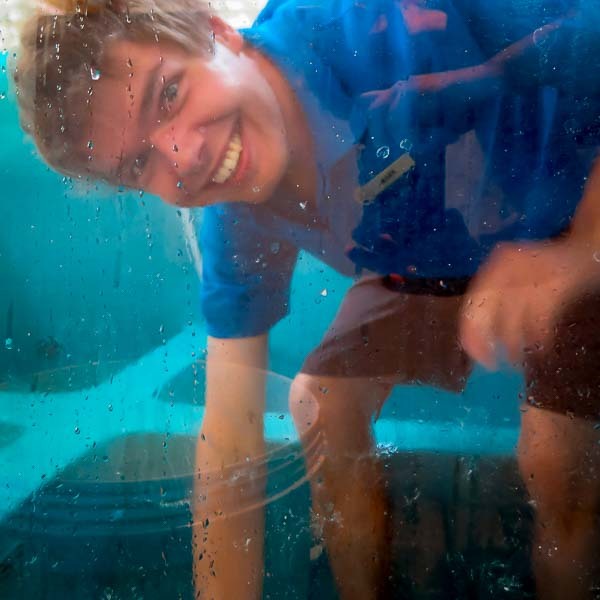 My name is Mark and I am the new volunteer Marine Biologist here at Four Seasons Resorts Maldives. I will be working as part of the Marine Savers team here in the Maldives for a total of 10 weeks, spending five weeks at Kuda Huraa followed by five weeks at Landaa Giraavaru. Having graduated from Bangor University (Wales) in 2012 with a Masters in Marine Biology, I have spent the last few years working in public aquaria/zoos in my home city of Chester (England). 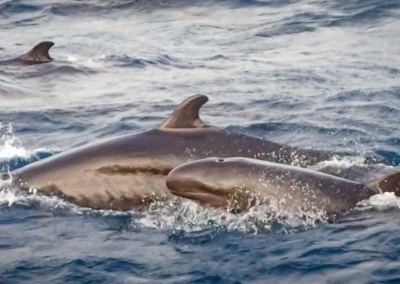 Although I really enjoy working in this industry, my passion lies in marine conservation. 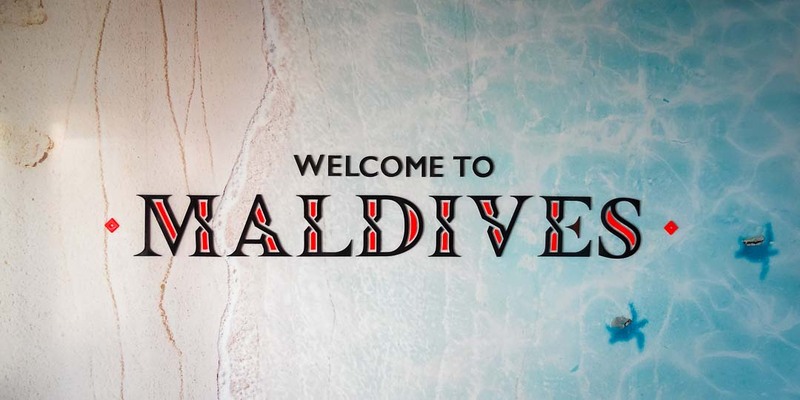 Therefore, in order to gain more practical experience in this field, I decided to come out to the Maldives and join forces with the Marine Savers team. After spending a week in Doha (Qatar), I arrived in the Maldives and came straight to Kuda Huraa from the airport. From literally stepping out of the airport and onto the resort speedboat, I was completely blown away by how amazing the Maldives is; hot sun, blue skies, and crystal-clear waters … paradise! On my first day at the resort, I was shown to my accommodation on the neighbouring local island of Bodu Huraa and given time to unpack and settle in. I was then taken on a tour of the island by Ben (Marine Discovery Centre [MDC] manager) and shown all of the staff facilities as well as my place of work – the Marine Discovery Centre. This is where I got to meet the rest of the Marine Savers team and find out about all of the conservation projects they are currently working on. In my first week, I spent a lot of time learning about and working with the resident sea turtles currently receiving care at the MDC. Five of the seven sea turtle species are found in the Maldives and at present the MDC is home to individuals of three different species: Green turtles (Chelonia mydas), Hawksbill turtles (Eretmochelys imbricata) and Olive Ridley turtles (Lepidochelys olivacea). 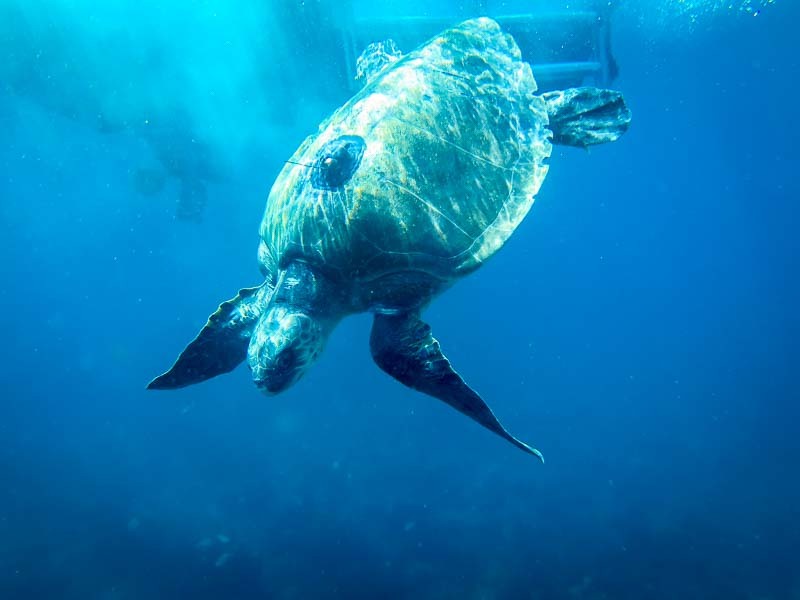 Most turtles at the centre are individuals that have been found stranded, floating in the ocean, entangled in drifting ‘ghost’ fishing nets or previously kept as pets around the Maldives. The turtles are sent to the MDC for rehabilitation, care and in some cases medical treatment, before being released back into the ocean. 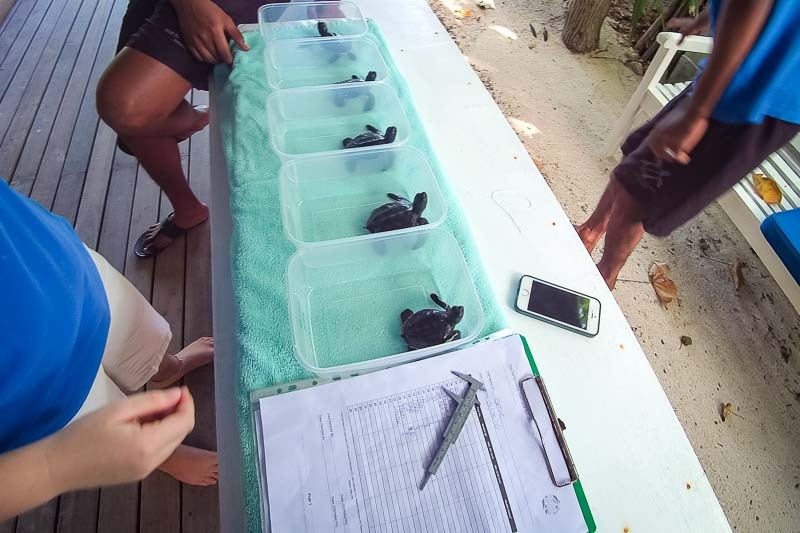 Other turtles are part of the ‘Head-Start’ Programme, whereby hatchling turtles that would not naturally survive in the wild are admitted and reared before release. We are essentially giving them a ‘head-start’ in life. From my second day here, I have been busy helping to look after these turtles by preparing their food, feeding and cleaning out rehabilitation pools. I have also been assisting with the weekly sea turtle monitoring, whereby we take weight and size measurements of each turtle individually, and give them a general health check to track their progress. Caring for these turtles has been great fun and each one has its own personality. One amazing individual is a green turtle named Crush. 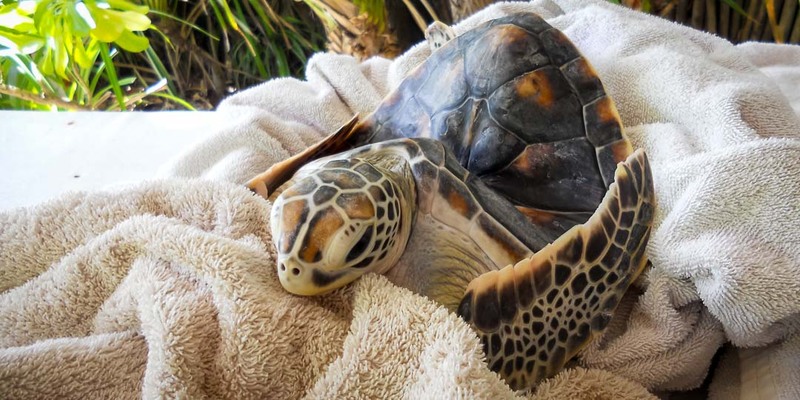 Crush had been previously (and illegally) kept as a pet on a local Maldivian island and whilst a juvenile, he sustained an injury to his fragile shell resulting in a deformity. Unfortunately during his time at the centre Crush’s shell has continued to bend further in half, but despite this he still appears to be full of energy! At present, Kuda Huraa’s turtle biologist Jamie is looking at possible options to prevent further bending and hopefully allow Crush to sit the right way up. Crush is definitely a favourite amongst guests visiting our turtle pools as each one asks about him and leaves knowing his full life history. Therefore, Crush himself is an excellent ambassador, helping to educate people about the reasons why these animals should never be kept as pets. 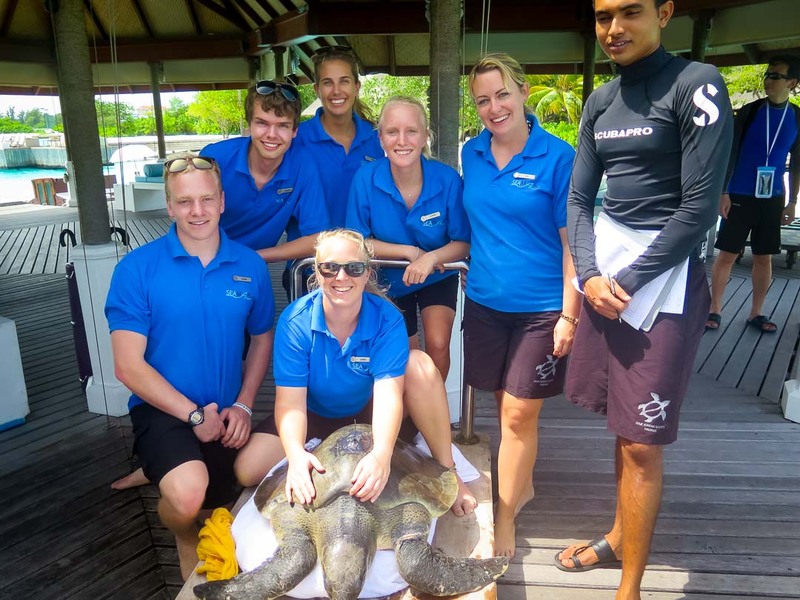 As well as working with the sea turtles I have also been assisting on the various guest excursions that run each day such as the coral reef adventure snorkel, shark and turtle safari snorkel and the evening dolphin cruise. These excursions allow guests staying at the resort the opportunity to see just how amazing the marine life of the Maldives really is, as no two snorkels are the same! 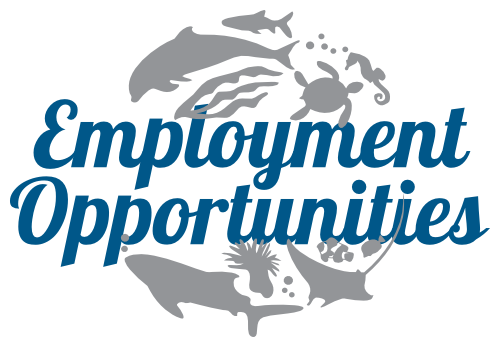 They also allow us as marine biologists the opportunity to educate and share important conservation information on how we can protect the rich marine life of the coral reefs. On these excursions, I have been assisting both on the boat and in the water and I have just started to lead them myself – which I am really enjoying. 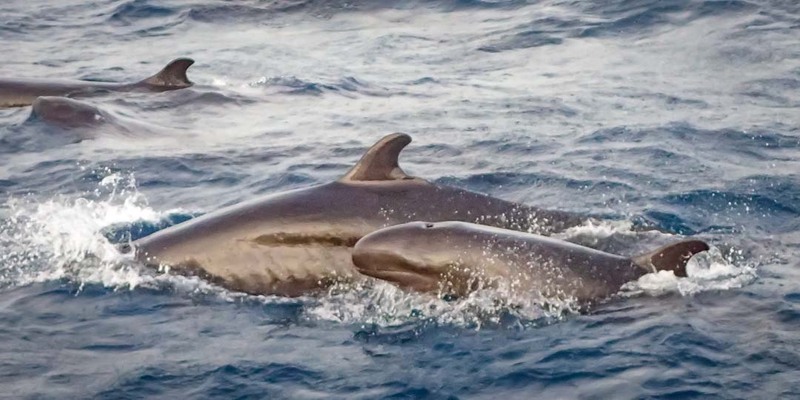 On the dolphin cruises we have had lots of spinner dolphin (Stenella longirostris) sightings recently, and on one cruise that I will never forget, we were incredibly lucky to encounter a large pod of false killer whales (Pseudorca crassidens), which was an incredible experience! 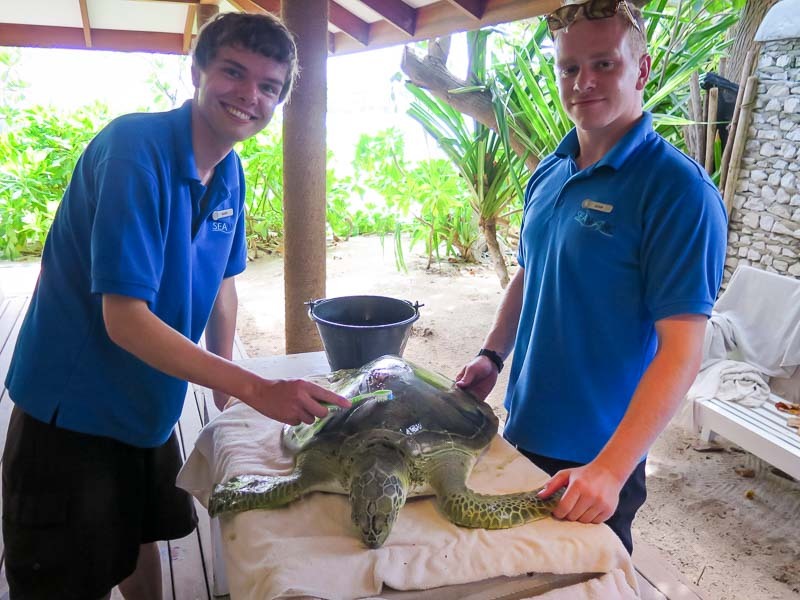 Over the last couple of weeks we have been busy with our sea turtles, welcoming 6 new arrivals over the last month. These include two very young hatchlings, a large hawksbill, a large green turtle (Aleena), and two large Olive Ridleys (Nash & Greg). All of these turtles have been living at the MDC and receiving care. Nash the Olive Ridley arrived at the MDC after being found entangled in a drifting ‘ghost’ fishing net, but despite no severe injuries, she could not dive. Luckily within a few days Nash had recovered and was happily diving again. On 16 June (World Sea Turtle Day) we successfully released Nash back into the ocean where she belongs. We wish her the best of luck back in the wild! So that’s a brief overview of my time in the Maldives so far, and as my five weeks at Kuda Huraa is unfortunately drawing to an end, I am excited to move on to the next stop – Landaa Giraavaru. 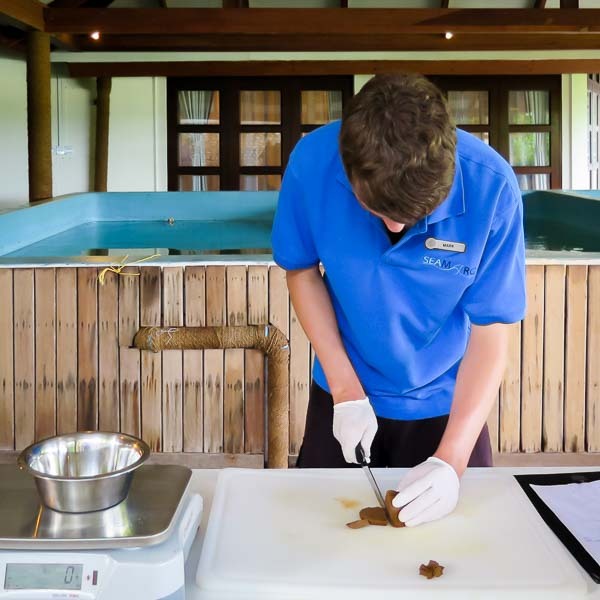 Here, I am really looking forward to meeting the team, their resident sea turtles and helping out on the various research projects they are running … especially the ornamental fish-breeding project.